Mesoscale convective systems occur worldwide and year-round and are accompanied by the potential for severe weather and flooding. This lesson describes typical system evolution by examining squall line, bow echo, and MCC characteristics throughout their life cycles. 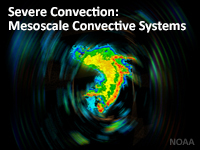 This lesson has less emphasis on the physical processes controlling MCS structure and evolution than our previously released Mesoscale Convective Systems: Squall Lines and Bow Echoes lesson. Instead, this newly updated lesson includes more material on tropical squall lines, MCC's, and on NWP’s ability to predict convective systems. The lesson starts with a forecast scenario and concludes with a final exam. Rich graphics, audio narration, and frequent interactions enhance the learning experience. My biggest issue with this lesson is how long it is. I feel like it should be broken up into a part 1 and part 2. The length of the lesson makes it difficult to retain everything. This is a tough lesson but incredibly rich on information, it takes many reads for it to be digested properly. I'll definitely come back and read it again even though i passed the quiz. It could use some refreshing based on newer models and newer model names. Compared to the MetEd courses I have taken so far, this one is disappointing. 1) some of the graphics were mislabeled.2) some of the looping graphics had no dwell on the last frame - particularly frustrating in a review question that depended on the last frame in order to identify the correct answer.3) in my opinion, the material in this module should be broken into 3 separate modules with more extensive explanations 4) although I passed the quiz, I'm not sure that I learned an adequate amount of the material presented. Lesson is too long. Needs to be split up into separate lessons. Great visual aids to back up lectures for the topics within the lesson. The module described in excellent detail mesoscale convective systems and factors that modulate the strength of these systems. I really like all of the videos. It was just a really long lesson that might be better broken up into multiple parts. A little challenging at first, but overall a very good lesson. Very helpful operationally. This one was really hard but if you can print out the course module I found it helped a lot towards learning it. After completing this lesson, you should be able to do the following things. September 2016: This lesson has been updated to conform to current HTML standards and brings the original content to a new, easier to navigate format. The title was changed, dropping the numeral from Severe Convection II. July 2014: Due to its age, this lesson contains products generated from the Eta model, which is no longer in operational use. This primarily impacts the MCSs and NWP section. Additionally, while the information presented is largely still valid, it does not include new discoveries including MCSs initiated as elevated convection, not surface convection. Much of this work is covered in literature by Schumacher.